X-rays, MRI, CT, PET & PET/CT are just some of the more familiar imaging technologies today used to see what’s happening inside of us. While these advanced imaging techniques are common today, there is often confusion about what the differences are and more so, when how they are best used and when. Shields Health Care Group, the leading provider of outpatient services such as MRI, PET/CT and X-ray, has more than 30 locations throughout New England and sheds some light on the differences between these important imaging techniques. What is an x-ray? An x-ray machine uses the unique properties of x-rays (electromagnetic radiation) to create an image of bones and dense material inside your body. An x-ray machine is essentially a camera that uses x-ray beams to see through our soft tissue in order to give us an image of the bone, chest, abdomen and other parts of your body. There is some risk involved with x-ray because of the exposure to radiation, however the amount of radiation you’re exposed to during an x-ray depends on the body part being examined and your age (children are more sensitive than adults). Generally, physicians feel that radiation exposure from an x-ray is low and that the benefits from an x-ray outweigh the risks. X-rays are commonly used to image bones and teeth, chests & abdomens to find fractures, infections, dislocations, bone decay and other conditions. What is an MRI? Magnetic Resonance Imaging (MRI) systems allow medical professionals to “see” the inside of the body with outstanding clarity. With MRI images, physicians can easily identify areas of treatment, track progress, and rule out serious problems with greater speed and accuracy than ever before. An MRI scan involves no surgery, no radiation, and no hospitalization, and has no known side effects. An MRI system uses a powerful magnet, radio signals, and sophisticated computer software technology. Because certain atoms in our cells respond or “resonate” lightly in the presence of magnetic fields, the MRI is able to use that response to create an amazingly clear, detailed picture of internal organs, muscles, connective tissue, and the central nervous systems. Detailed MRIs allow physicians to better evaluate parts of the body and certain diseases that may not be diagnosed as accurately with other imaging methods. MRIs are typically used to examine the brain and all other internal organs, as well as diagnose sport injuries and determine the presence of certain diseases. While there are a range of uses for MRI, the two most common categories at Shields are neurological and orthopedic. MRI is also used to identify anomalies in the breast and the prostate. What is CAT or CT Scan? : A CT scan, or Computed (Axial) Tomography scan combines x-rays and computers to create images of bone, soft tissue and blood vessels all at once. Sometimes a contrast dye is used through injection into the blood stream that makes the internal body structure more visible in the image. CT scans usually take around 5 minutes to complete, and are often used in emergency rooms as a result of the speed in which they can produce results. Because CT scans use x-rays the body is exposed to radiation during the scan. CT scans are typically used for bone injury, chest and lung imaging and cancer detection. What is a PET Scan? : A PET scan, or Positron Emission Tomography, uses a radioactive “tracer” that is injected into the body which collects in organs and tissue. It takes around an hour for the “tracer” to be absorbed. The PET will then detect the “tracer” in the body and use this information to see how the organs and tissue are functioning. Because PET scans can detect changes at the cellular level, they can detect diseases before they are apparent on other imaging tests. PET scans are typically used to detect cancer, heart problems, brain disorders and problems with the central nervous system. Often PET scans are combined with CT scans so that only one exam is performed. 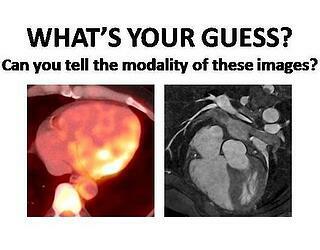 IMAGE INFORMATION: the image on the left is a PET/CT scan; on the right is an MRI scan.